Well a few weeks ago I had an opportunity like this at the Orba Health and Well Being Christmas Market, run by Bridin Mullan. Bridin approached me and my sister Louise a few months ago to ask if we would like to run a food stall and with little hesitation I said yes. My (sorry our) very own food stall I thought, a great opportunity to conduct practical market research to find out if we could sell food products – and ensure our friends and relatives had not bloated our egos all these years by pretending we could cook. Sister took a little more convincing than me; her measured response was to consider the practicalities of running a stall, weighing up production costs, time and resources before rushing in. Thankfully she decided to come on board and her logical ‘watch the pennies and the pounds will roll in’ approach helped temper my ‘you have to spend lots of money to make money’ frivolity. 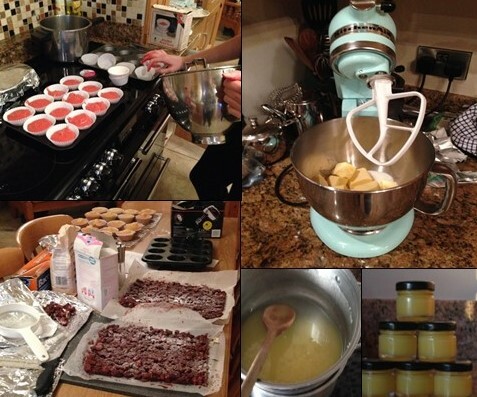 Product selection was a key task at the start of the process, we wanted to bake Christmas themed treats that we could produce cheaply, in bulk and with a good profit margin. I appointed myself honorary project leader, (and in my trusted opinion did a good job and held our team of two together well), but all good project managers need a wise head on board to reign them in when necessary. I will admit to getting carried away in the cash and carry and nearly blew £7 on a packet of pretty brown paper bags, until Louise gave me ‘the look’ and said I could have the plastic version at less than £2; in this instance she was right to curb my spending, not least of all because I forgot to bring the bags to the market. Two areas we both agreed there would be no compromise on were product quality and packaging. 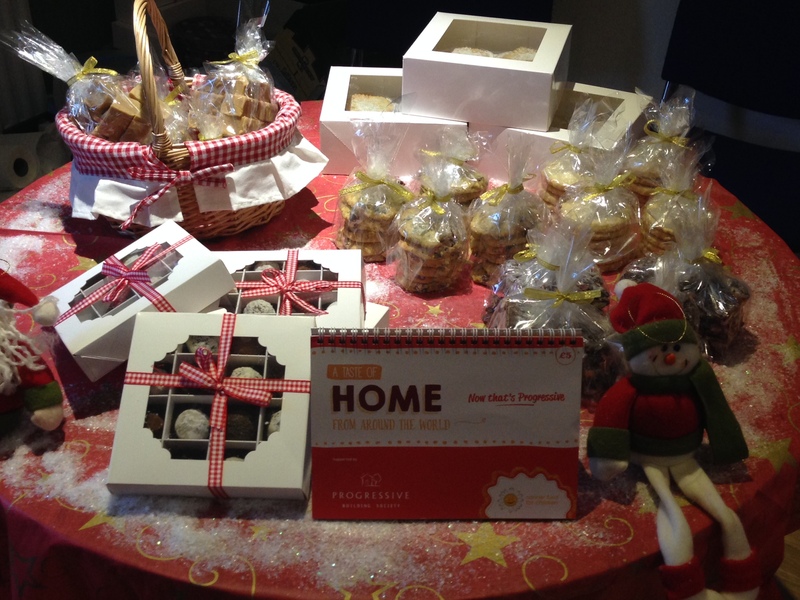 Our truffles, mince pies and Christmas Cupcakes were packaged in pastry boxes with display windows bought online and the shortbread, other biscuits and the fudge were wrapped in clear plastic film and tied with decorative gold and red ribbons. Time and money spent on packaging was a worthwhile investment; the visual impact of attractive looking products justified the hours spent slaving away in the kitchen. Louise and I had taken a half day from work and left ourselves a lot to do in the final hours with the majority of our products needing baked at the last minute for optimum freshness. Our parents kindly allowed us to use their kitchen and with cupboard doors doused in flour, burnt hands and failed batches of dough, preparation day was slightly manic as the whole family burned the midnight oil on the production line. Strangely I did not get nervous during the planning stage or cooking process, yet that night when everything was boxed and ready for transportation to the market, I went to bed and suddenly thought what if no one comes or customers don’t want to buy our stuff? On the morning of the market we arrived early and Bridin had transformed her studio into a festive market area. We set out our stock along with the other traders selling everything from bespoke jewellery to knitwear, candles and Christmas wreaths – and the nerves quickly settled when things began to take shape. Soon a steady flow of people started to trickle in, we had plates with samples of our bread, jam, fudge and biscuits laid out to entice customers to our stall. The feedback (pardon the pun) was really good and my festive marmalade with a kick of whiskey was a real hit. I often serve this along with smoked cheese on crackers and presented it this way for people to taste which showed the versatility of the marmalade to work as a jam or chutney. Louise’s homemade fudge which was soft, sweet and creamy also left customers wanting more and had sold out by lunch time.  Buy ingredients like, flour, butter and chocolate in bulk.  Allocate enough time to maximise production, excess stock can always be re used.  Invest in good packaging for your products and create eye catching displays.  Conduct good market research for the area and have a clear pricing strategy. 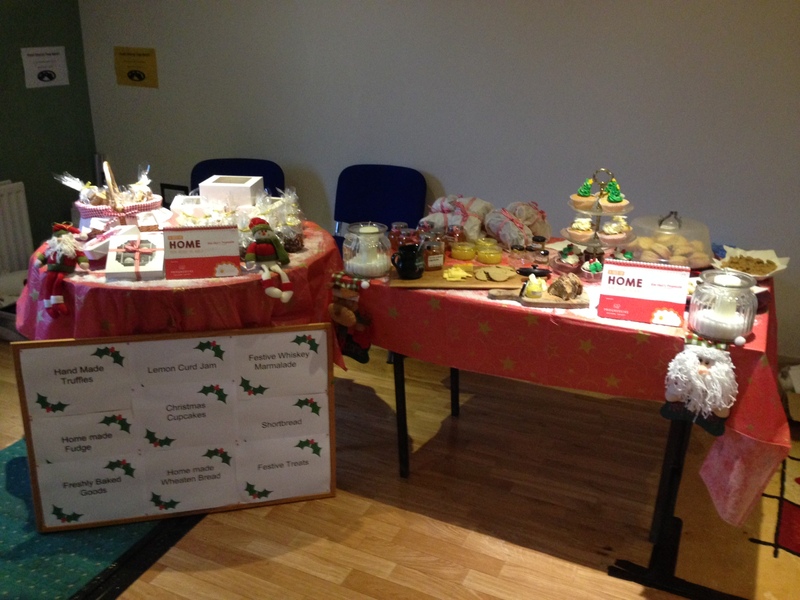  Have samples of the products to entice customers to the stall.  Be enthusiastic about what you are selling, know the ingredients, offer serving suggestions and have fun. The market ended at 5pm and we had sold out of all our products shortly after 3.30pm and at close of business had covered our costs and earned enough to reward ourselves with a new Christmas dress, one each obviously. Preparing for the market was tough, it took time, money and effort as we had to practice our recipes before baking in bulk for the real thing, yet it was a great learning experience and a real feeling of satisfaction to see the goods we had baked so well received. I woke up on the Sunday morning tired and my hands ached but if I had any stock left over this little piggy would have been ready to go to market again… now I just need to convince Louise. Recipes will be posted during this week in time for Christmas baking. 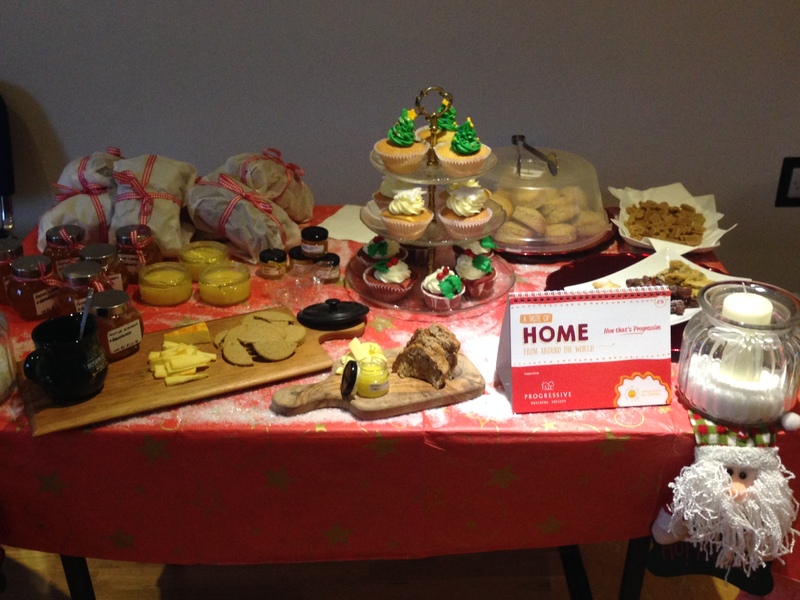 This entry was posted in Features and tagged christmas market, cupcakes, fudge, lemon curd, lord sugar, mince pies, Orba health and well being, the apprentice, truffles, whiskey marmalade by Michelle Loughran. Bookmark the permalink.